It’s a historic time to sell a single-family home in Moultonborough. Data suggest conditions are record-breaking … but they won’t last forever. Prices in 2018 set a new record in Moultonborough. Last year’s $406,750 median "closed" price for single-family homes bested the previous record, set in 2006, by more than $14,000. This set the highest median closed price since 1997, which is as far back as data go in the New England Real Estate Network Multiple Listing Service database. In other words, we’re going into spring and summer of 2019 with sales prices for Moultonborough single-family homes the highest they’ve ever been, making it a historic opportunity to sell. Prices won’t continue to climb at this pace forever. Real estate moves in cycles: Home prices go up and down based on a variety of factors. For example, consider the aftermath to the previous peak in 2006. Moultonborough single-family home values eventually plunged a whopping 37 percent by the market bottom in 2013. That would be equivalent to a $150,000 loss in value from 2018’s median price. Sellers who missed the chance to sell at the previous peak had to either painfully absorb the loss in value or wait with regret more than a decade for home prices to recover to 2006 levels. The current upward trend in home price is not sustainable for one simple reason: Moultonborough home-value increases are far exceeding income increases in New Hampshire and Massachusetts, our two largest buyer markets. For example, Moultonborough median home prices jumped 41 percent between 2013 (the most recent market bottom) and 2017 (the most recent year for which income data are available). During that same period, real median household income in New Hampshire and Massachusetts increased just 2.7 percent and 11 percent, respectively. 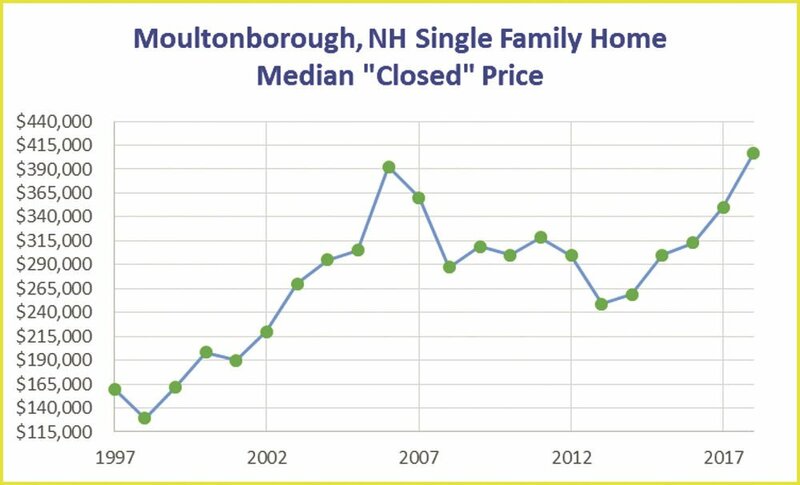 When you consider that already-rising Moultonborough median single-family closed prices spiked another 16 percent between 2017 and 2018, you can see why I think it’s more likely for area home prices to stall or decline than to continue climbing at these historic rates for much longer. What goes up must come down. If you’re still not convinced we’re at or near the peak of the seller’s market, let me add another consideration that seriously impacts buyers: interest rates. The Federal Reserve hiked interest rates four times in 2018, and has plans to increase them more than once in 2019. Mortgage interest rates tend to echo changes made by the Fed. Higher home prices and rising interest rates result in higher monthly payments for buyers, which in turn slows homebuyer activity, which in turn causes skyrocketing home prices to stall or even reverse course. There is good news: a window of opportunity. Mortgage rates recently declined to the lowest level in more than a year, making it an even more compelling time for home-sellers to list right now. This low rate will be welcomed by buyers, but it will not last. Finally, much of the historic price growth in Moultonborough is predicated upon the historic economic boom this nation has seen since January 2017, but, like the real estate market, the economy also moves in cycles. Another recession is inevitable, a matter of when, not if. Nearly half of the real estate experts and economists who responded to a recent Zillow survey predicted 2020 for the next recession. That’s why I think right now, spring 2019, offers a historic opportunity to sell, while the selling is good. If high prices alone aren’t enough to convince you, consider another key indicator of a seller’s market: the history-making pace of “days on market” required to sell. The year 2018 saw another record in Moultonborough. 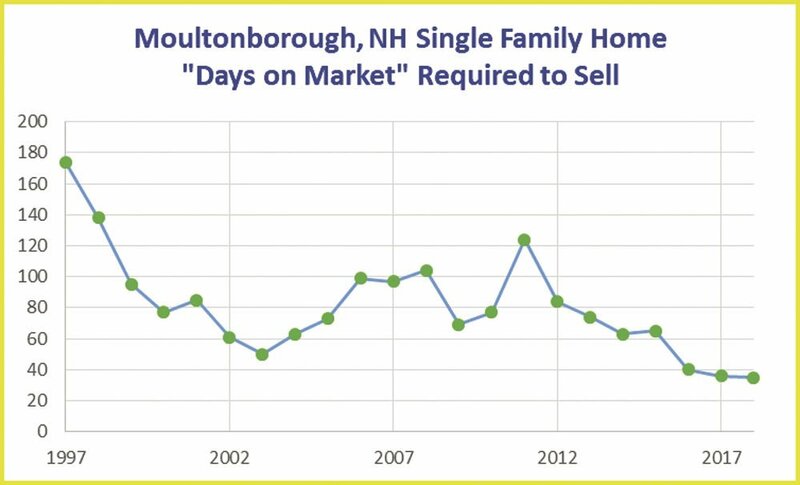 In addition to the highest median closed prices, last year the median number of days on market for Moultonborough single-family homes was just 26. That’s a 42 percent drop from the already-brisk clip in 2017, and the fastest sales pace in at least 21 years, possibly ever. The number of days on market tends to be inversely proportionate to buyer demand. A low number of days on market suggests high buyer motivation. My theory is that Moultonborough is especially attractive to shrewd in- and out-of-state buyers seeking low property taxes in the state with the nation’s third-highest rates. There’s another important factor that makes this a great time to sell: limited inventory. In addition to the highest home values and fastest-selling pace in more than two decades, Moultonborough currently has an extremely low number of houses listed. Today there are only 41 single-family homes listed in Moultonborough, a town the U.S. Census Bureau estimates to have a population of 4,044 people and 4,523 housing units. A low supply of for-sale homes creates leverage for sellers. Buyers are more willing to overlook perceived shortcomings in a home (like dated countertops or no garage) when inventory is tight and there’s less competition. When there are fewer properties to compete with, the result can often be multiple offers, stronger negotiating position and higher prices for sellers. By listing now (yes, in March) you can get a head start on the competition and stand out to buyers who want to begin enjoying a new Lakes Region home in time for summer 2019. Remember, many closings take 45 to 60 days to complete. So please take action if you’ve been waiting for a great time to sell. It’s now. Moultonborough homes have been selling at the highest prices and fastest speeds in more than 20 years. Inventory is low, giving sellers who list now a head-start advantage before inventory and competition inevitably increase. Contact me if you’ve considered selling your house in Moultonborough and you’re curious what your home might sell for in this seller’s market. Your home equity has risen with mortgage payments and renovations made over the years, and with all the other comparable houses that have recently sold at 2018’s higher prices. It might be the best time in history to sell a Moultonborough single-family home, and homeowners who missed the opportunity to sell at the previous peak had to wait 12 long years for home values to recover. Brent Metzger is a Realtor® with Roche Realty Group. Contact him at 603-229-8322, or learn more at www.LakesRegionHomeSeller.com.